WASHINGTON — The Supreme Court’s decision to partially reinstate President Donald Trump’s temporary travel ban has left the effort to keep some foreigners out of the United States in a murky middle ground, with unanswered questions and possibly more litigation ahead. President Trump’s revised travel ban will be tested this fall at the Supreme Court. 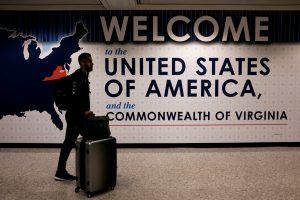 On the final day of their term, the justices reinstated a limited version of the order, affecting travelers from six majority-Muslim countries. Judy Woodruff discusses the implications of the court’s decision with Marcia Coyle of The National Law Journal and Alan Gomez of USA Today.